After multiple extensions last week, Senate Judiciary Chairman Chuck Grassley, R-Iowa, gave Ford a deadline of 2:30 p.m. on Saturday to decide whether she would testify before the panel next week. If she did not comply, the committee would go ahead with a vote on Kavanaugh's nomination on Monday. In an email to the committee, lawyers for Ford said that while she has agreed to "provide first-hand knowledge of Kavanaugh's sexual misconduct," they are disappointed "with the leaks and bullying that have tainted the process." The timing and terms of the hearing are still unclear, as negotiations continue between Ford's attorneys and the Senate Judiciary Committee, but in a letter, Ford's lawyers said they were "hopeful that we can reach agreement on details." The email also indicated that Michael R. Bromwich, former inspector general of the Justice Department, has joined Ford's team of lawyers. Bromwich currently represents former FBI Deputy Director Andrew McCabe, who was fired earlier this year. Ford alleges Kavanaugh groped her and tried to forcibly remove her clothes during a house party in Bethesda, Md., in the early 1980s. Kavanaugh has denied the allegation and said he would appear before the committee next week. "Brett Kavanaugh has been clear from the beginning—he categorically and unequivocally denies this allegation and is eager to testify publicly to defend his integrity and clear his good name," White House spokesperson Kerri Kupec said in a statement. "On Monday, Brett Kavanaugh met with Committee counsels to answer questions subject to criminal penalties and offered to testify publicly Tuesday morning. Since then, we have heard about different dates, conditions, and ever changing schedules, but today we appear no closer to a fair hearing. 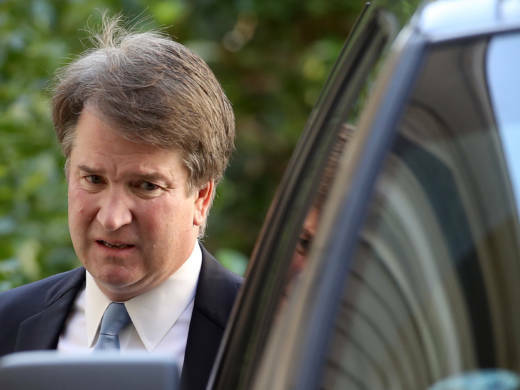 But one thing has remained consistent: Brett Kavanaugh remains ready, willing and eager to testify as soon as possible." As the Saturday deadline approached, NBC News reported that Garrett Ventry, a communications aide on the Senate Judiciary Committee who had been helping lead the response to Ford's claim against Kavanaugh, was stepping down after evidence surfaced that he was fired from a previous job partly because of sexual harassment allegations against him. Ventry denied any past "allegations of misconduct," according to NBC News. He told The Washington Post that he resigned "in order to not be a distraction" as Republicans in the Senate continue to work on getting Kavanaugh confirmed. This abrupt resignation is one more point in the chaotic timeline of Kavanaugh's confirmation struggle.